Make 40 pages of Brag-book fun..."Loonies for Littles!" This afternoon I used the "Loonies for Littles" kit (benefiting Big Brothers, Big Sisters of Canada) to create a 40 page brag book... man, was that fun! We'll be making this book on Friday June 13th, so it's not too late to contact me to order your kit and help benefit this great cause -- Stampin' Up! is donating $2 to BBBSCA for each kit purchased. What's WITH Toronto weather anyways? This May has just been lousy, with maybe 2 nice days in the whole month, sheesh. Here are two more cards I've just stamped while praying for better weather. If you're interested in attending the class, please click here for more info. The Beautiful You card was inspired by Debbie Jaeger. These are cards for tomorrow's 10 card class... enjoy! Don't just take MY word for it!!! How about you? If you're a demonstrator who loves what she does, please share some of the reasons why below in my comments field. I'd love to read your responses!!! Stamping on furniture -- Shelli-style! If you want to see some examples of stamping on furniture for home décor, check out this article HERE which features Stampin' Up! 's lovely CEO and co-founder Shelli Gardner! You'll want to be sure to scroll to the end to see the pictures -- beautiful! It makes me want to take out my Baroque Motifs stamp and go crazy. 2 more Birthday class cards! You can't see it very well due to the strong shadow (not that I'm complaining about the sun, no no no no....) but there's a wee red bead in the centre of the elephant's flower. Birthday cards + a studio-warming gift! First off, let me share 3 of the 5 cards we'll be making at tomorrow's Birthday Cards class, 'cuz one can never have enough birthday cards on hand! But better yet, here's a picture of the amazing studio housewarming present Dina gave me this weekend at our team meeting: it's a fabulous wall-hanging she made using chipboard coasters of our group name, "Canadians, INK!". Isn't it the coolest thing ever? Here's a close-up of part so you can see the level of detail it has. THANK YOU, DINA - I LOVE IT! Here's Dina with Carol's daughter, Courtney... we love playing "pass-the-baby" at our meetings -- LOL! I have spaces available for Saturday afternoon's class (1 pm at my Toronto studio) == please visit my Classes & Events page for more details and to RSVP. P.S. 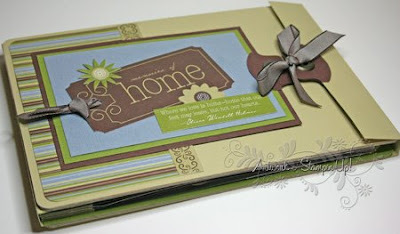 My Family Treasures Ini Scrapbook class is tomorrow (Friday)... I have spots for the 7pm class if you would like to join us! Here are the other 2 projects we'll be making at the Carousel Cards class on Wednesday night! I still have space open... please let me know if you are interested in attending. The first 2 images are of a chocolate treat holder, using the Carousel Note scored and folded, then belly-banded (is that a word) with Ginger Blossoms Designer Paper and a matching pouch on the inside for the chocolate. The card uses half of a Carousel Note trimmed and layered on a traditional size card... with some paperpiercing, use of the Die-Cut Blooms, some Iridescent Ice embossing of the sentiment, and a fun beaded Build-A-Brad! If you missed the first sample I posted for the class, you can see it here. Here is one of the 3 cards we will be making using the new Carousel Notes from the Occasions Mini Catalogue. These wonderful jumbo die-cut scalloped circle cards are so much fun, and come in Groovy Guava, Soft Sky and Wild Wasabi -- all of which are in our 2007/8 "In Color" palette. They measure about 6" x 6" and even come with matching Chocolate Chip envelopes! COST: $19.95 for class, includes 3 completed jumbo cards with envelopes and 3 extra Carousel Notes for you to take home and play with! 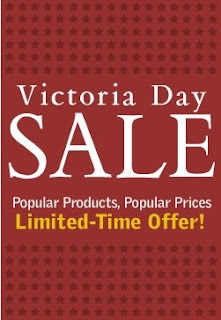 Victoria Day Sale -- 4 days only! It's the Victoria Day long weekend here, and what better time to offer you faithful blog readers a super duper special sale than right now?!?! Please note, this offer will only be good until midnight Tuesday May 20th (to accomodate those of you who read your blog updates at work..hehe) and is available to Canadian customers only. I'll be enjoying time with my family & 2 year old niece Sarah this weekend (that's her pictured below with my daughter Serena, son Morgan and my SIL Lisa) .. I hope you get the chance to enjoy this long weekend as well! Please contact me by email or phone (416-694-4074/1-866-694-4074) to take advantage of these special offers before May 20th!